As customary, the UFC’s Facebook page is streaming the first four fights for “UFC 166: Velasquez vs. Dos Santos III.” However, why go over there when you can watch them right here on 5thRound.com? 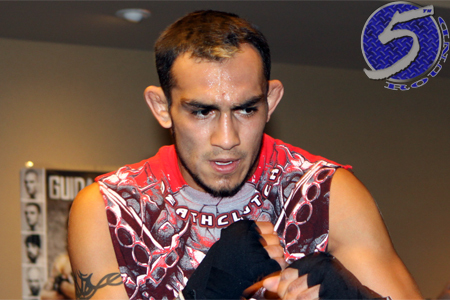 Catch Dustin Pague vs. Kyoji Horiguchi, Jeremy Larsen vs. Andre Fili, Tony Ferguson (pictured) vs. Mike Rio and Adlan Amagov vs. T.J. Waldburger live starting at 6:15PM ET/3:15PM PT. Fox Sports 1 will then air the remaining four preliminary bouts immediately after at 8PM ET/5PM PT. The pay-per-view broadcast begins at 10PM ET/7PM PT. The “biggest trilogy in MMA history” headlines tonight’s show when heavyweight champion Cain Velasquez puts his crown up for grabs against Junior dos Santos. He utterly destroyed dos Santos just 10 months ago in their rematch to reclaim his hardware.